Personal Locker Storage | Spacesaver Solutions Inc.
Police officers, military personnel and emergency response teams have very tough and demanding jobs. Having a streamlined space of their own to store gear while off-duty – and their personal items while on-duty – can increase morale during long days. In partnership with Spacesaver, we have engineered personal duty lockers designed with your personnel in mind. Personal Duty lockers and Spacesaver’s Freestyle storage lockers can be configured and customized to accommodate each individual’s personal storage needs. 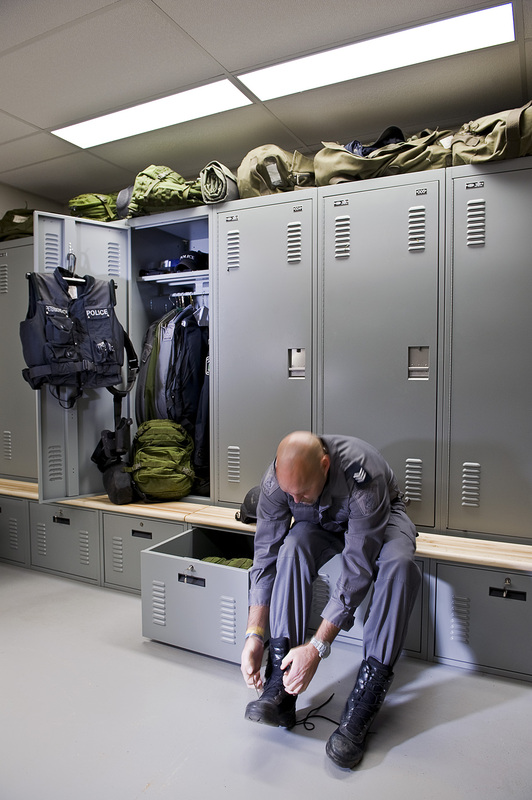 Personal duty lockers offer a wide range of options to securely store equipment, uniforms, weapons, electronics, and more. For added comfort and breathability, the lockers can be equipped with air ventilation systems and pull out benches. Interested in learning how the right locker systems can make a difference in your department? Contact Spacesaver Storage Solutions today and receive a free space assessment.